Samsung chose the biggest advertising day of the year in the United States to debut their Apple mocking, Samsung Galaxy Note commercial which aired for the first time during Super Bowl XLVI. The commercial, which featured a number of blatant attacks toward Apple, featured possibly an ageing British rock band as well as quite possibly the biggest mobile phone I have ever seen, which even comes with a stylus. Yes, 2012 and Samsung are releasing top of the range smartphones with a pen. So, is the Samsung Galaxy Note all about its size, or behind its rather large exterior is it actually packing some powerful technical muscle? The current head boy of the smartphone range is undoubtedly the Apple iPhone 4S, with units flying off the shelves faster than the company can make them and helping to produce record financial results for Apple towards the end of 2011. Both the 4S and Galaxy Note feature a dual-core processor with the Note running at 1.4 GHz and featuring 1GB of RAM to the 4S’ 512MB. But I guess the fact that the device contains a whopping 5.3" screen and measures in at 145.8 x 82.95 x 9.65 mm and features a stylus will always grab the news. At some point in all of our lives, I am pretty sure we have come up against phones bigger than ours and felt inferior, or on the flip side of that have been in the presence of someone having a noticeably smaller phone and felt confident and all powerful. I think the experts refer to it as ‘little man syndrome’ or the ‘Napoleon complex’ in some cases, where smaller individuals feel inferior due to their height. The syndrome is named after Napoleon Bonaparte as it was generally believed that he sought out power, war and conquest to make up for his lack of height. 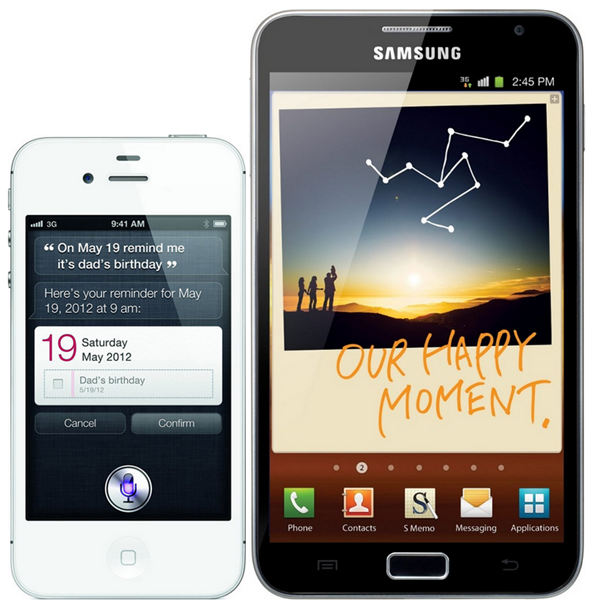 Considering the iPhone 4S is drastically smaller than the new Galaxy Note, should it be suffering from the Napoleon Complex, or should it feel comfortable in its own skin? 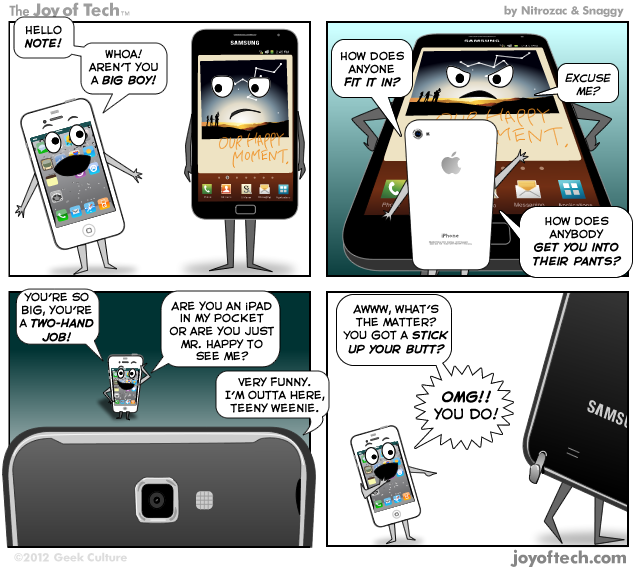 JoyOfTech have produced a nice little cartoon which highlights just how a possible meeting between the iPhone 4S and the Samsung Galaxy Note could go. The cartoon obviously plays on the fact that the Note is a mammoth device, and even manages to make reference to the fact that it comes with a stylus for on-screen usage which we still can’t get our heads around. I think it is quite obvious which device won in this little encounter, and to be quite honest; I would imagine that the sales figures will also have the same outcome as well. Does anyone have any intentions of trying out the Galaxy Note? Let us know through our Facebook and Google+ pages.